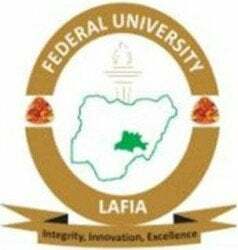 Federal University, Lafia, FULAFIA remedial/pre-degree admission form for the 2018/2019 academic session is out. FULAFIA pre-degree form is now obtainable from the School of Basic and Remedial Studies. Applications are invited from suitably qualified candidates for admission into the One-year Remedial/Pre-degree programmes of the Federal University Lafia for 2018/2019 academic session. The University runs various Science, Social Science and Arts based degree programmes in the following Faculties: Arts, Science, Basic Health Science and Social Sciences. At the end of the programme the students will be required to meet the JAMB cut-off marks and pass the internal examination for admission into 100 level undergraduate programmes of the University. FULAFIA Remedial/Pre-Degree Admission – Entry Requirements. Remedial programme (Science): A candidate must have at least three (3) O’level credits which must include either of the following: English Language, Mathematics, Biology, Chemistry and Physics. Remedial programme (French): A candidate must have at least three (3) O’level credits which must include either of the following: English Language, Mathematics, French or Literature in English. Pre-Degree programme (Science): A candidate must have at least five (5) O’level credits including English Language, Mathematics, Biology, Chemistry and Physics in not more than two sittings. Pre – Degree programme (French): A candidate must have at least five (5) O’level credits including English Language, Mathematics, French, Literature in English and any other in not more than two sittings. How to Apply for FULAFIA Pre-Degree / Remedial Admission. a. Interested applicants should go to any Commercial Bank and make a payment in favour of Federal University Lafia, TSA Account (Please note that there is no use of Account Number). Present payment receipt issued at the Bank to the School of Basic and Remedial Studies for Confirmation and issuance of payment receipt. b. Alternatively, go to www.remita.net and generate Remita Retrieval Reference (RRR) yourself and proceed to Bank to effect payment and present the receipts as indicated above. (Please use the GIFMIS Reference Number (GRN) 1000057612 when prompted to input it by the system). When generating RRR select the fees option and proceed to make your payment. The form, which costs N5, 500. 00 (Five Thousand Five Hundred Naira) only, would be on sale from Monday, July 23, 2018, to Wednesday, October 31, 2018. For more enquires, please, contact the following numbers: 07032729824, 08062361547, 08065815733, 08063073368.